i. Richard P Dawson, born 29 Aug 1791 in Bourbon Co., KY; died 26 May 1866 in Roaring Springs, Trigg, Kentucky, USA; married Rebecca Foree 19 Dec 1819 in Shelby Co., KY.
ii. Patsy Dawson, born Bet. 1792 - 1794 in Bourbon Co., KY; married Henry Bedford. iii. Lucinda Dawson, born 1793 in Bourbon Co., KY; married (1) James F Beazley; married (2) Cohen. iv. Rachel Dawson, born 27 Apr 1793 in Bourbon Co., KY; died 24 Aug 1872 in Bourbon, Kentucky; married Cpt Rezin H Gist 07 May 1812 in Montgomery Co., KY.
v. Rebecca Dawson, born Bet. 1795 - 1796 in Bourbon Co., KY; died 1874 in Bourbon Co., KY; married William DeGraffenreid; born Abt. 1775.
vi. Jane Dawson, born 1801 in Bourbon Co., KY; died 1850; married Cornelius Burnett. vii. Mary Clay Dawson, born 02 May 1805 in Bourbon Co., KY; married William T Hutchison. viii. Bartlett Dawson, born 1807 in Bourbon Co., KY; married ? Pendleton. ix. Thomas Henry Dawson, born 11 Sep 1809 in Bourbon Co., KY; died 1848; married Letitia DeGraffenreid. x. Henrietta Dawson, born 25 Jan 1812 in Bourbon Co., KY; died 20 Oct 1890 in Montgomery, Kentucky, USA; married James Prewitt 04 Sep 1828 in "in her sister's house", Mt. Sterling, KY; born 26 Sep 1802 in Fayette Co., KY.
xi. Augustus Green Dawson, born Abt. 1815 in Bourbon Co., KY; died Abt. 1858; married Wilmoth Northington 21 Nov 1847 in Christian Co., Kentucky. From the State Land Office, Virginia, Warrant 1335: “I do certify that Thomas P. Dawson is entitled to the proportion of land allowed a private of the State Line for three years service”. -- Signed Benjamin Harrison & Thomas Meriweather. In 1816 he came to Christian Co. and bought land. The deeds are on file in the Christian Co Court House. In 1819 he made a deed to sell his Bourbon Co farm; the deed is on record in that county. He built a brick house in Christian Co that is still standing. There is a block of stone in the chimney that has 1816 cut into it. In 1820, Trigg Co. was split off from Christian Co. and his land was now in Trigg Co. His home was near Roaring Springs; he is buried in the family grave yard in the old place. He died in 1829. His estate is on record in the Trigg Co. Courthouse. His oldest son Richard P. Dawson was one of the executors. His wife Mary Ann (Clay) died in 1845. In her will (attached) she left the place to her son Augustus Green Dawson, as he had lived in the house and taken care of her. John and Dorcas Hildreth are named in a 1795 deed. On 18 October 1796 John Hildreth of Bourbon County, Kentucky bought from William Anderson part of a 10,000 acre survey in Clark County, Kentucky..
3. Mary (Polly) Kenney (1779-after 1850); married William Hildreth (c1776-1816), of Bourbon Co., Kentucky. She told her children that she remembered riding in front of her father on horseback when the family moved from Virginia to Kentucky. William HILDRETH and Mary Polly Polly KENNEY. They were married on 21 May 1801. They had 6 children. i. William Henry HILDRETH [5, 16]. He was born 1809 in Paris, Bourbon, Kentucky, United States . He married Mary Elmira HORN. They were married on 26 Sep 1869 in Edgar, Edgar, Illinois, USA. He died 1889 in Vermilion, Edgar County, Illinois, United States . iii. Dorcas Tabitha HILDRETH . She was born 1812 .
v. John S HILDRETH . He was born on 09 Jan 1805 in Paris, Bourbon, Kentucky, United States . Residence 1860 in Carroll, Vermillion, Illinois . He died on 04 Mar 1876 .
vi. Alvin Kenney HILDRETH . He was born on 17 Dec 1802 in Bourbon, Kentucky, United States . Residence 1870 in Carroll, Vermilion, Illinois . He died on 19 Jul 1874 in Vermilion, Illinois, United States . The families include Drohan, Jordan, Cummins, Swearingen, Schwartz, Mackey, Holleran and Murphy. 1. DANIEL1 JORDAN was born 1803 in Wexford Co., Parish of Ballindaggan, Ireland, and died November 02, 1873 in Paris, KY. He married ELIZABETH. She was born 1803 in Ireland, and died 1895 in Paris, KY. Both are buried at Mt. Olivet Cemetery, Paris, KY.
1870 census, Daniel & Lizzie lived 4 households away from Pierce & Anna Drohan. Daniel is a laborer and Lizzie is a Murphy Nurse(?). He became a U.S. citizen in Bourbon Co. on 7/23/1873. 2. i. MICHAEL2 JORDAN, b. 1839, Ireland. 3. ii. ELIZABETH (ELIZA) JORDAN, b. October 1844, Ireland; d. Paris, Bourbon Co., KY.
4. iii. ANNA JORDAN, b. September 18, 1845, Ireland; d. December 02, 1904, Covington, KY.
iv. WILLIAM JORDAN, d. June 05, 1866, Paris, KY.
Burial: Mt. Olivet Cemetery, Paris, KY.
2. MICHAEL2 JORDAN (DANIEL1) was born 1839 in Ireland. He married MARY CUMMINS. She was born 1848 in KY.
Godparent to Mary Drohan who was born on 10/25/1868. 1870 census: Living in Paris, KY; occupation - cooper. We know Mary's maiden name from her son Daniel's baptism record. 5. i. KATY3 JORDAN, b. November 1867, KY.
6. ii. DANIEL JORDAN, b. October 12, 1868, Paris, KY.
7. iii. ELIZABETH (LIZZIE) JORDAN, b. 1871, Paris, Bourbon Co., KY; d. August 07, 1934, Paris, Bourbon Co., KY.
iv. WILLIAM C. JORDAN, b. 1873, Paris, Bourbon Co., KY; d. January 11, 1907, Paris, Bourbon Co., KY.
Wm. C. Jordan, aged 34 years, employed at the Paris Distilling Company as engineer in the bottling department, was found dead at his post of duty about 5 o'clock Friday afternoon. Mr. Jordan had been at work all day and was apparently in the best of health. He was seen by his fellow workmen about 3 o'clock. One of them had occasion to go to the engine room and there found the dead body of his friend lying near the closed furnace door, the fires having died down and but little steam showing in the gauge. Dr. Wm. Kenney, Coroner, was notified, and viewed the remains after which they were removed to the residence of his mother, Mrs. Mary Jordan, who lives near by. Mr. Jordan was a quiet, unobtrusive and an industrious young man, well liked by a large circle of friends. He was a member of Garth Lodge, A.O.U.W., and held an insurance policy of $1,000 in the order. The immediate cause of his death was due to apoplexy. Mr. Jordan is also survived by three brothers and four sisters - Messr. Dan Jordan, ticket agent of the Louisville & Nashville railroad, and Mike Jordan, both of Paris, and John Jordan, of Lexington, and Mrs. Sam Mackey, Mrs. M.J. Murphy and Misses Annie and Susie Jordan, all of Paris. The funeral services were held at the Catholic Church, Sunday afternoon, at 2:30 o'clock, services being conducted by Rev. Father James Cusack. Burial at Catholic Cemetery. The pallbearers were: T. Lenihan, J.P. Hutchcraft, Ed McNamara, A.W. Cottingham, Earl Swearingen and R.M. Ice. v. NELLIE JORDAN, b. November 29, 1874, Paris, KY.
vi. JOHN JORDAN, b. 1876.
vii. MIKE JORDAN, b. 1879; d. November 09, 1925, Bourbon Co., KY.
viii. ANNA (ANNIE) I. JORDAN, b. Paris, Bourbon Co., KY; m. ALBERT EARL SWEARINGEN, June 03, 1907, Paris, KY.
A quiet and pretty wedding was that of Miss Anna I. Jordan and Mr. Albert Earl Swearingen at the residence of the officiating minister, Rev. Father Cusack, on Tuesday afternoon, at 4 o'clock. The attendants were Miss Sue Jordan, sister of the bride, and Mr. Wm. Swearingen, brother of the groom. The bride is the daughter of Mrs. Mary Jordan, and an attractive and lovely young lady. The groom is the son of Mr. and Mrs. W. G. Swearingen, and a popular young man, being an efficient attaché of the Paris post office. The happy couple left for Chicago via Lexington, where they will spend a few days with Mr. and Mrs. D. L. Armstrong, the latter a sister of the bridegroom, when they will make an extended visit to cities of the Northwest. 3. ELIZABETH (ELIZA)2 JORDAN (DANIEL1) was born October 1844 in Ireland, and died in Paris, Bourbon Co., KY. She married JACOB (JAKE) SCHWARTZ 1860. He was born 1837 in Germany, and died February 04, 1915 in Paris, Bourbon Co., KY.
1900 Census: She was born in October 1844 in Ireland; immigrated to the U.S. in 1858; has been married for 40 years (1860); bore 4 children with 2 still living; she can't read. Living with Schwartz' in 1900 is their grandson, Henry J. and their adopted daughter Nellie. Nellie was born in Ireland in October 1874 (age 25) and is single. 1904 - From "The Bourbon News", 11/29/1904 - Mrs. Jake Schwartz left for Covington yesterday to be at the bedside of her sister, Mrs. Ann Drohan, who is seriously ill.
1905 - From The Bourbon News - Dr. Henry J. Schwartz of Danville, is the guest of his grand parents, Mr. & Mrs. Jake Schwartz. 1910 - Nellie, single, is still living with them on High St., West Side. In the 1870 census Jacob's occupation was baking & confectionary. The value of he real estate was $5,000 and personal property was valued at $8,000. In the 1900 census it states that Jacob was born in August of 1835, 64 years old, and owns a saloon. Year of immigration was stated as 1857. Both of his parents were from Germany. His grandson, Henry J. was living with them along with an adopted daughter Nellie on West Main St.
Died at age 78 in BOURBON Co., on 02-04-1915. Volume 007, Certificate 03196. 8. i. HENRY J.3 SCHWARTZ, b. 1860, KY.
9. ii. JOHN A. SCHWARTZ, b. December 27, 1864, KY; d. 1910.
iii. LIZZIE SCHWARTZ, b. 1868. 4. ANNA2 JORDAN (DANIEL1) was born September 18, 1845 in Ireland, and died December 02, 1904 in Covington, KY. She married (1) PIERCE DROHAN September 12, 1863 in Paris, KY. He was born April 10, 1836 in Ireland, and died August 19, 1879 in Paris, KY. She married (2) THOMAS C. WADE October 01, 1880 in St. Mary's Cathedral, Covington, KY. He died Abt. 1888. In 1870 Anna was keeping house in Paris, KY. She had two domestic servants, a white female and a black male. When Pierce died in 1879, Anna took over running the grocery store. The store was located on the east side of Stoner Creek on the Maysville & Lexington Pike, across the street from their home. In the 1880 census, her oldest child John (15) was no longer in school. Anna had a servant, Lydia Wilson (23), helping her out. On October 1, 1880, Ann Drohan married Thomas C. Wade. It was the second marriage for both. They were married in Covington, KY, claiming residence in Paris, KY. Ann's age is listed as 30. Thomas was listed as a cooper. In 1900 she is living in Covington, KY with the following children: Mary, Edward, Josie, Anna & Katie, all single. She did not have an occupation listed. Mrs. Ann Drohan, a resident of this city about 25 years ago, died at her home in Cincinnati Friday. She was a most excellent woman and will be remembered by our older citizens. She is survived by one sister, Mrs. Jake Schwartz, of this city, and seven children, three sons and four daughters. Funeral services were held at Covington and burial took place yesterday morning from the 11:57 train in Paris cemetery. Besides her seven children her remains were accompanied to Paris by about 15 of her friends from Cincinnati. She had been in failing health for some time, but a severe fall recently hastened her death. She was about 64 years old. First record of Pierce in the U.S. - 1860 Census living in Cynthiana, KY. Also, Cynthiana tax records for 1860 - Owns 1 Horse valued at $70. He does not appear in the prior or next year. Appraisement Bill of the personal Estate of Pierce Drohan Deceased, as presented to us, this 25th day of August 1879. There is a Thomas Wade living in Paris, KY in 1880 (per census) living with the Murphy's 5 doors down from Anna Drohan. 10. i. JOHN W.3 DROHAN, b. July 26, 1864, Paris, KY; d. September 10, 1913, Elgin, IL. ii. ELIZABETH FRANCES DROHAN, b. July 26, 1865, Paris, KY; d. August 26, 1865, Paris, KY, Disease unknown. 11. iii. DANIEL GEORGE DROHAN, b. June 07, 1866, Paris, KY; d. June 30, 1915, Covington, KY.
iv. MARY BELLE DROHAN, b. August 02, 1867, Paris, KY; d. August 18, 1867, Paris, KY.
v. MARY BELLE DROHAN, b. October 25, 1868, Paris, KY; d. December 07, 1914, Paris, KY; m. THOMAS J. MURRAY, June 17, 1886. Mary was listed in the 1886 - 1887 Covington directory as working as a domestic and living with her brothers Daniel and John. vi. ELIZABETH (LIZZIE) G. DROHAN, b. February 27, 1870, Paris, KY; d. June 07, 1895, Paris, KY.
12. vii. EDWARD J. DROHAN, b. September 23, 1871, Paris, KY; d. June 03, 1907, Covington, KY.
viii. JOSEPHINE G. DROHAN, b. March 31, 1873, Paris, KY; d. November 27, 1944, KY. Living with her sister Katie in the 1910 & 1920 census. ix. P. H. DROHAN, b. June 25, 1874, Paris, KY; d. June 25, 1874, Paris, KY.
x. ANNA MARIA DROHAN, b. May 18, 1875, Paris, KY.
xi. CATHERINE (KATIE) P. DROHAN, b. May 27, 1876, Paris, KY; m. JOHN WILLIAM (WILL) POULIN, May 27, 1908, St. Patrick Church, Covington, KY; b. 1876, Massachusetts. Nellie Wade was the witness for marriage. 5. KATY3 JORDAN (MICHAEL2, DANIEL1) was born November 1867 in KY. She married SAMUEL (SAM) MACKEY 1886. He was born May 1858 in KY, and died July 17, 1937 in Bourbon Co., KY. In the 1930 census, Katy and Sam live on Main St. in Paris, KY, down the street from Mike and Lizzie Murphy. i. JOHN B.4 MACKEY, b. April 1890. 13. ii. AGNES MACKEY, b. August 1895. 6. DANIEL3 JORDAN (MICHAEL2, DANIEL1) was born October 12, 1868 in Paris, KY. He married MARY HOLLERAN July 1901 in Carlisle, KY, daughter of MICHAEL HOLLERAN. Mr. Dan Jordan and Miss Mary Holleran, both of this city, were married in Carlisle Tuesday by Rev. Father Hickey. Mr. Jordan is the accommodating baggage agent of the L. & N. in this city, and is a popular young man. Miss Holleran is a pleasant and attractive young lady, who is much admired by her many friends. They returned to this city on Wednesday night. Dan Jordan, the genial and always accommodating ticket agent at the local L. & N. office, thinks that patience is one of the greatest assets a railroad man can have, besides a thorough knowledge of his business. "I get a chance," said Dan, "to see human nature in all its phases. We see a great deal more than we tell. But just imagine yourself answering a hundred different questions; making change anywhere from fifteen cents to fifty dollars; hunting up railroad guides while a train is coming in; announcing trains; waiting on patrons at three different windows; hunting up railroad connections; answering telephone calls; trying to administer a polite rebuke to the man in a hurry who elbows ladies away from the window; dallying with the persistent and festive drummer - in short, a thousand and one things that have to be attended to in a rush, when four or five trains are coming in at the same time and you will admit after careful study that it requires the patience of Job or some other saint. Through it all we try to serve the traveling public faithfully, politely and without any partiality." And no one does it more conscientiously than "Daniel" and his assistant A. B. Motch. i. DAUGHTER4 JORDAN, b. September 1903.
ii. WILLIAM HOLLERAN JORDAN, b. 1907. 7. ELIZABETH (LIZZIE)3 JORDAN (MICHAEL2, DANIEL1) was born 1871 in Paris, Bourbon Co., KY, and died August 07, 1934 in Paris, Bourbon Co., KY. She married MICHAEL J. MURPHY 1892, son of JOHN MURPHY and MARY. He was born 1868 in KY, and died 1934 in Paris, Bourbon Co., KY.
Lizzie (wife); age 28 (1872); born in KY; Father born in Ireland; Mother born in KY.
1905, The Bourbon News - History of Bourbon Co. The Paris Transfer Co. is conducted by M. J. Murphy. He not only handles the largest per cent of the freight that is brought to Paris, but will handle anything from a toothpick to a mountain, or anything else that comes in line with general transfer business. He makes a specialty of moving pianos or other heavy furniture and will move your household furniture or business fixtures on the shortest notice, and in the most expeditious manner, always exercising due diligence. Mr. Murphy has long been associated with the business interests of Paris and from the beginning he established a reputation for splendid business methods. In connection with his transfer business in which seven or eight teams are employed, Mr. Murphy conducts large sale stables for livestock of all kinds, having well equipped stockyards with ample sized stock pens under cover. Here on court day and other public days can be found the choicest selections of livestock raised in the county. The excellent equipment and splendid care of stock brought to his yards has gained for Mr. Murphy a reputation among the stockmen of this and adjoining counties, and we would say to all interested in live stock to see the Paris Transfer before going elsewhere when you wish to buy or sell. They also handle a large stock of baled hay, straw, corn, oats and other feed. Michael is 40 & Lizzie is 38. Michael is a proprietor of a transfer company and Lizzie is a dressmaker. They and their two children are living on Main St.
Michael is 51 & Lizzie is 48. Both daughters are still living with them (ages 25 & 23) on Main St. Mary is a stenographer for a grain house and Catherine is a stenographer for a lumber company. Michael is 62 & Lizzie is 59. Mary no longer lives with them. Catherine lives with them with her husband of 4 years (married 1926), Leonard McCann (age 27). Leonard works for the railroad. i. MARY4 MURPHY, b. July 1894.
ii. CATHERINE MURPHY, b. November 20, 1896, KY; d. January 1982; m. LEONARD MCCANN, 1926; b. 1903. Burial: Mt. Olivet, Paris, KY.
8. HENRY J.3 SCHWARTZ (ELIZABETH (ELIZA)2 JORDAN, DANIEL1) was born 1860 in KY.
i. HENRY J.4 SCHWARTZ, JR., b. February 1885. 1910 Census: He is living with his grandparents, Jacob & Elizabeth Schwartz. 9. JOHN A.3 SCHWARTZ (ELIZABETH (ELIZA)2 JORDAN, DANIEL1) was born December 27, 1864 in KY, and died 1910. He married (1) MARY A. She was born 1865, and died 1893. He married (2) ANNA (ANNIE) C. 1898. She was born 1874 in KY, and died November 01, 1947 in Bourbon Co., KY.
1910 Census: Living in Paris, KY on Pleasant St.; married for 12 years to Anna; employed as a saloon keeper. Anna's parents were from Ireland. In the 1920 and 1930 census, both Elizabeth and Anna May are single and living with their mother. Both are bookkeepers. 1920: still living on West Pleasant St. and took on a young family as boarders: Edward and Margaret Woods and their daughter Anita. 1930: value of estate put at $5,000. i. EILEEN4 SCHWARTZ, b. 1892.
ii. MARGARET4 SCHWARTZ, b. 1899.
iii. ELIZABETH SCHWARTZ, b. 1900; d. April 20, 1982, Fayette Co., KY.
iv. ANNA MAY SCHWARTZ, b. 1904. 10. 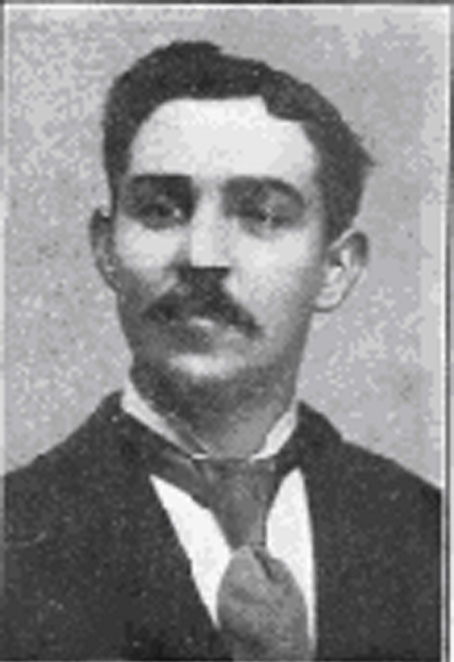 JOHN W.3 DROHAN (ANNA2 JORDAN, DANIEL1) was born July 26, 1864 in Paris, KY, and died September 10, 1913 in Elgin, IL. He married VICTORIA ROSER May 03, 1892 in Campbell County, KY, daughter of JOSEPH ROSER and MARY FRAY. She was born January 27, 1867 in Newport, KY, and died July 07, 1956 in Jacksonville, FL. John W. Drohan was born in Paris, Kentucky on July 26, 1864. Not long after his father died in 1879, the family moved to Covington, KY.
John worked as a cooper in Covington in 1884 - 1885, living with his brother Daniel and his stepfather Thomas Wade at 132 Johnston St.
John was listed in the 1886 - 1887 Covington directory as working as a laborer and now living with his brother Daniel and sister Mary. John was not listed in the directory from 1888 - 1891. John, Vic and Pierce were living in Newport, KY in 1900. John was a bartender. Vic's sister, Theresa, was living with them. 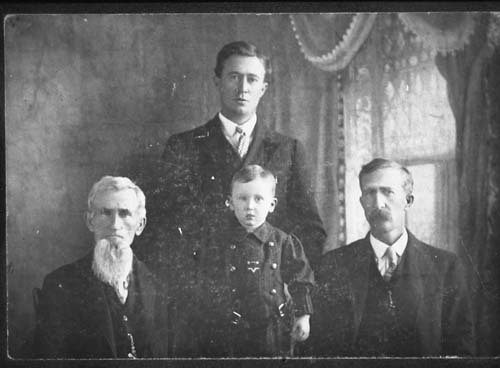 John, Vic and Pierce were living in Elgin, IL in 1910. John was a precision timer and Vic was an operator at the Elgin Watch Co. Pierce was a music student. John died around 8:30 pm on September 10, 1913 at his home on 205 National Street in Elgin, Illinois. The last 9 years of his life, he was a resident of Elgin and worked at the Elgin National Watch Company in the timing department. He died after a long illness (two years) of pulmonary tuberculosis. He was buried at Mt. Hope cemetery at 10:00 am on September 13, 1913 in Elgin. His simple headstone, made of poured concrete, reads John W. Drohn, 1864 - 1913. Yes, his last name is misspelled. Maybe his wife and only child never saw the finished product. John was well known in the city of Elgin. He was a member of the Modern Woodmen of America, The Court of Honor, the Elks, and the Riverside Club. The Modern Woodmen was a fraternal benefit society designed to provide financial security to families from all walks of life. During the deadly tuberculosis epidemic of the early 1900s, they opened a sanatorium outside Colorado Springs to provide aid to members stricken with the disease. Typhoid fever broke out in August 1916 in Elgin, a few years after John's death. About 200 residents, most of them watch workers and members of their families were stricken. Twenty-four deaths from typhoid were reported that year. The source was an artesian well at the watch factory that had been contaminated by river water seepage. In the 1884 - 1885 Newport directory she is living at 22 Bellevue and is a cigar maker. Vic's sister Louise is listed as head of household. She ran a boarding house at 226 E. First St. in Jacksonville, FL. She has six boarders, not including her sister Victoria who lived with her. 14. i. FRANCIS PIERCE4 DROHAN, b. June 20, 1893, Newport, KY; d. July 15, 1954, Jacksonville, FL. 11. DANIEL GEORGE3 DROHAN (ANNA2 JORDAN, DANIEL1) was born June 07, 1866 in Paris, KY, and died June 30, 1915 in Covington, KY. He married LOUISA BRUNSMEN June 02, 1902 in Covington, KY. She was born 1870 in Ohio, and died December 13, 1942 in KY.
After his father died in 1879, the family moved to Covington, KY.
Daniel worked as a cooper in Covington in 1884 - 1885, living with his brother John and his stepfather Thomas Wade at 132 Johnston St.
Daniel was listed in the 1886 - 1887 Covington directory as working as a rolling mill hand and now living with his brother John and sister Mary. He was listed as being a car painter in the 1888 & 1889 directory. In 1900 census, did he live with his Aunt & Uncle Henry & Josephine Bindley, both born in 1850 and living in Indianapolis, IN? Is this where he met his future wife? i. ANNA MARY4 DROHAN, b. 1903, OH; m. GEORGE GREER, June 27, 1924.
ii. JOSEPH EDWARD DROHAN, b. 1903, KY; d. December 30, 1958, Kenton Co., KY; m. DELORES WELP, June 29, 1940; b. Abt. 1913; d. February 24, 1998. Delores Anna Drohan, 85, of Covington, died Tuesday at Rosedale Manor, Latonia. She was a seamstress with the Mack Shirt Co. Survivors include sisters, Mary Keller of Elsmere and Angela Moser of Cincinnati. Mass of Christian burial will be at 7 p.m. Thursday at St. Henry Church, Elsmere. Visitation will begin there at 6 p.m. Thursday. Burial will be in Mother of God Cemetery, Ft. Wright. Stith Funeral Home, Florence, is handling arrangements. iii. GEORGE DAVID DROHAN, b. August 19, 1904, KY; d. January 16, 1983, Kenton Co., KY; m. EVELYN ELIZABETH GEGHNER, Covington, KY.
15. iv. PIERCE J. DROHAN, b. August 19, 1904, KY.
v. HELEN C. DROHAN, b. November 01, 1908, KY; d. February 19, 1996, Oakwood, Montgomery County, OH; m. POGUE. 12. EDWARD J.3 DROHAN (ANNA2 JORDAN, DANIEL1) was born September 23, 1871 in Paris, KY, and died June 03, 1907 in Covington, KY. He married ELIZABETH PIEPER June 1901 in Covington, KY. She was born Abt. 1883. Deceased Councilman Will Be Buried Tomorrow at St. Mary's Cemetery. Police Will Act as a Guard of Honor - Many Honorary Pallbearers. The remains of Councilman Edward J. Drohan will be buried tomorrow at St. Mary's Cemetery. The funeral services will be held at St. Patrick's Church at 8:30 a.m. Father James Smith will officiate. The city officials and a guard of honor of the Covington police will march ahead of the funeral procession from his home on Main St. to the church. The officials are requested to meet in the Council Chamber at 7:30 a.m. tomorrow. The members of the Order of Eagles, of which he was a member, and also of three smoking casinos, will attend the funeral in a body. The Eagles will meet this evening at 7:30 to take appropriate action on his death and name honorary pallbearers. The smoking casinos will also name honorary pallbearers. Police Judge Read of Covington announced this morning that the session of the Police Court tomorrow would not be called until after the services. The following have been selected by the family to act as active pallbearers: James England, William McAvoy, William Pickett, George Kieley, Patrick Halleran, James Thelan. Undertakers Donnelly Bros. will have charge of the funeral. 16. i. EDWARD PIERCE4 DROHAN, b. May 02, 1901; d. May 1986, Cincinnati, OH. ii. ELIZABETH FRANCES DROHAN, b. 1903, Covington, KY; d. May 04, 1903, Covington, KY.
iii. HELEN DROHAN, b. 1904, Covington, KY; d. January 06, 1908, Covington, KY.
JONES, JOSEPH Will Book 12, page 131 " Far advanced in years." Leonard D. White, George Pence. Joseph Jones among patriots who took oath of Fidelity and Support in the county of Harford, Md. In 1778, and his name appears in a list returned by Robert Amoss. After the Revolution he came to Bourbon County, Kentucky with the Amoss family and later moved to Shelby County, Kentucky, where his will is a matter of record. Military Records Vol. 1928 p. 242 Brumbaugh's Colonial Records, County and Church Records of Maryland, Robert Amoss list.